I encountered this critter near the southern end of Battery Park City, so I can't help but wonder if it's a descendent of the one I met back in the 1970s and wrote about here (somehow, my typo on "immigrant" made it through the Times's vaunted copy editing). Anyway, this one seemed more self-sufficient. 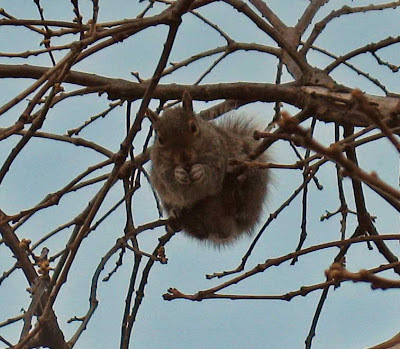 Have supply-side economic policies had a salutary effect on the squirrel community? 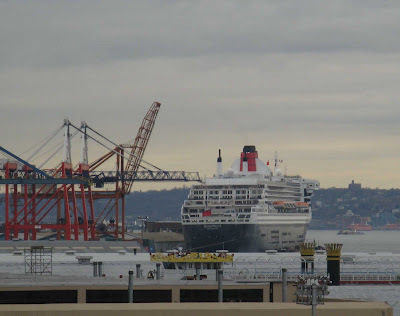 Queen Mary 2, yet again. Here she is, seen from the Battery Park City Esplanade, looming over Governors Island as she's docked at the Brooklyn Cruise Ship Terminal. 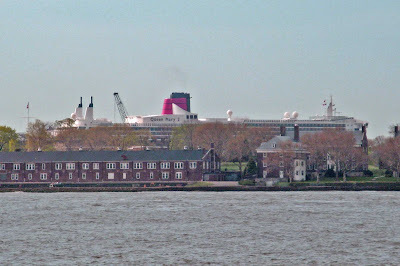 And here she is, viewed again from the Brooklyn Heights Promenade, with her "red duster" prominently displayed at her stern. If you are going to hit into a double play, you should have the good sense to strike out. Times Square, crossroads of the sky. The twin turboprop has probably just taken off from La Guardia, heading somewhere south. 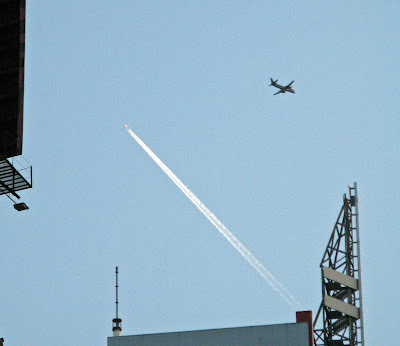 The jet leaving the contrail is flying north, perhaps Miami to Montreal.